Do you need a translator or an interpreter? What is the difference? Learn more in this article. Resolve to learn a new language in 2019. Register now to learn some basics of American Sign Language. The class will meet twice a week for 1.5 hours. Register for New English Classes! Register now for our upcoming ESL classes! Register to learn some basic American Sign Language. Learn finger spelling, greetings, simple conversations, and also about deaf culture in this six-week course that will meet on Mondays and Thursdays from 5:30 PM to 7:00 PM. Julie Metz, Execuitve Director of the Shelby County Chamber of Commerce, Interviewed Tanya Hoover of Midwest Language Services, LLC last week. Click here to listen to the interview. Julie Metz, Executive Director of the Shelby County Chamber of Commerce interviewed Tanya Hoover, President of Midwest Language Services, LLC on Giant 106.5 FM. Julie Metz, Executive Director of the Shelby County Chamber of Commerce, interviewed Tanya Hoover, President of Midwest Language Services on Giant FM, 106.5 in Shelbyville, Indiana. Tanya Hoover, President and Founder of Midwest Language Services, was invited to talk about her business on a radio show this morning that aired on 106.5 FM, The Giant. Executive Director of the Shelby County Chamber of Commerce, Julie Metz, invited Ms. Hoover to speak on the Chamber Chat radio show. While Tanya is not new to Shelby County, Midwest Language Services, LLC is. She started English as a Second Language teaching adult students from Yuma Industries when she started her business as a sole proprietorship nearly fifteen years ago. A new English as a Second/New Language (ESL/ENL) class is being offered by Midwest Language Services in Shelbyville, Indiana that will meet on Thursdays from 11:00 AM to 12:00 noon for non-native speakers of English. 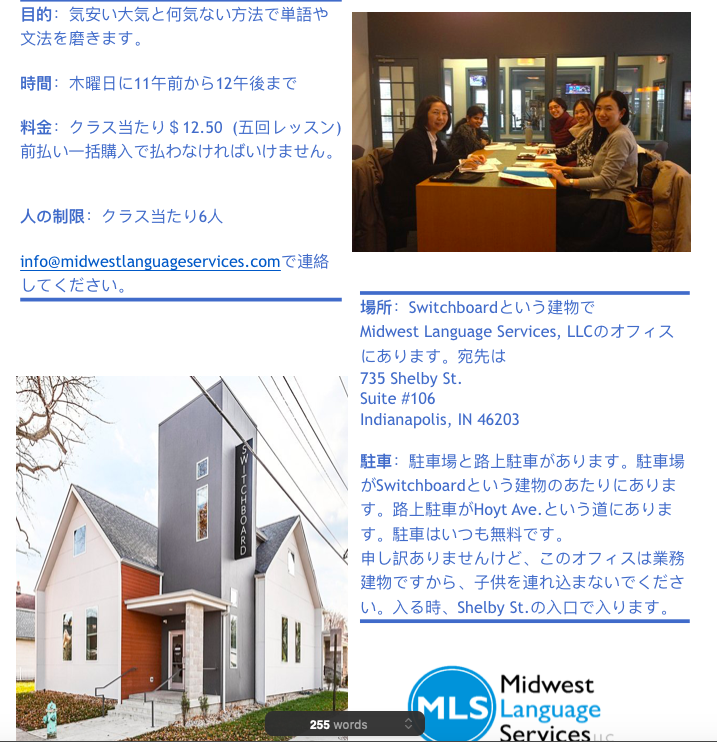 For more details about this and other services Midwest Language Services provides, such as sign language (ASL) interpreting, document translations, and other interpreting services, please contact us at info@midwestlanguageservices.com or call (317) 296-7997. Join us for a weekly English conversation group that will meet on Thursdays from 11:00 AM to 12:00 beginning in March. The cost for each class is $12.50. We will meet at 735 Shelby St., Suite #106, Indianapolis, IN 46203. Class size is limited to five students. We at Midwest Language Services, LLC want to continue making a positive difference in the lives of others in the new year. Are you looking for a job in the new year? Contact us about updating your resumé or writing an new one from scratch. Elissa Kaupisch, a certified life and career coach, has joined our team of expert communicators. Her role with Midwest Language Services, LLC will be that of a resumé writing and interview coach. Elissa is a Certified Life Coach, experienced Career Coach, and professional business seminar leader. She is a Certified John Maxwell trainer, speaker, and leadership consultant. As a Life and Career Coach, Elissa mentors, inspires, and empowers others to grow personally and professionally, assisting them in cultivating and achieving their desired goals in life and career. In addition, she is certified to coach people in both the Enneagram and DISC Personality Type inventories. Elissa holds a Masters Degree in Education, and has served as a college instructor at several colleges, teaching Career Development, Leadership Communication, Speech Communications, and Business & Technical Writing. Elissa is a Graduate of Dale Carnegie Institute's Effective Communications and Human Relations program and has assisted as a graduate assistant in their training programs. She has also achieved the level of Competent Toastmaster in Toastmasters International. Elissa has a passion for inspiring, encouraging, and helping others discover possibilities for their lives, examine and eliminate roadblocks to their success, and gain personal confidence and insight, as well as realize their potential. Elissa Kaupsich can help you with writing your resumé and practicing your interviewing skills. I recommend taking an improv class for so many reasons, one of which is that some of the exercises can become great springboards for ideas to get students to speak in a group language class. Knowing how to read and write in a language is quite different from speaking it. This is especially true with some Japanese women I have taught. Although their spouses may have opportunities to use English in the workplace, many Japanese women I’ve met tend to befriend other Japanese whose husbands have been assigned to work in the United States. Making American or other English-speaking friends can be tough. From what I have learned, the Japanese can read and write with a fair amount of clarity; however, forming spoken sentences doesn’t happen without a lot of thought first. Sometimes a series of imperfect sentences can communicate much more than a few perfectly constructed sentences. My goal is to create an environment in which students feel free to try to speak in front of their classmates and me with the understanding that they will be corrected afterwards so that they can ultimately improve and communicate more fluently. This has to be done carefully so the students are not discouraged from speaking at all. One recent activity that I did with a group of four women was to role play buying a used car. First, I introduced some vocabulary. Next, we listened to a dialogue while reading the script silently, and then the students were paired off. Each person took turns with the role of salesperson and car buyer while reading the script aloud. Afterwards, I modeled how to act out the skit without the script and emphasized that the skit did not have to exactly match the original dialogue. (I chose the most advanced student who was the least shy to help model how to do this.) After we completed the demonstration, I asked the women to work their partner and take turns playing each role without a script. After some practice, it was showtime. The grand finale was when I had the students speed up the performances from about five minutes to a time limit of three minutes. The result was that the students spoke more naturally, sounded more fluent, and were talking to an actual person while speaking. It wasn’t just reading from a script anymore. It was about interacting. Improvisation is a part of daily life. We may have patterns that we use in different situations, but ultimately, we think of what we’re going to say depending on whom we are speaking with and what the situation is. Rehearsing is a good idea when stakes are high, but reading from cue cards is not nearly as effective as communicating with the person in front of you.